"When one is painting one does not think." The youngest of the three greatest artists of the Renaissance was Raphael Sanzio. His father, Giovanni Sanzio, was also a painter who no doubt passed along knowledge along to his son. As a royal painter to the duke of Urbino, Federigo da Montefeltro, he defiantly had the credentials to train his son. Sadly, he died when his son was eleven. Giovanni's assistant, Evangelista di Pian di Meleto, began Raphael's early training, however, most of his formal training is given credit to Pietro Perugino, who was a great portrait artist and fresco painter that was one of the five painters that worked on the frescos on the wall of the Sistine Chaple. Raphael was a quite and laid back guy who lived a short, but very successful life. He was remembered as a man of flawless character, sweet natured, and quite good looking. It was said that he enjoyed the company of women. Because Raphael thought he might be able to become a cardinal, he was relutant to get too serious with any of the women in his life. Eventually, in 1514 he was engaged to a young woman, Maria da Bibbiena, who was the niece to the powerful Cardinal Bibbiena. After many postponments, it is said she died of a broken heart. Also a great lover of animals, he had a zoo in his house that included chickens, squirrels, badgers, monkeys, and a raven that was trained to talk. He only lived to the age of thirty-seven, but in his short life, had worked his way up to being named the official painter for Popes Pius III, Julius II, and Leo X. Over his years of service to the papacy, he was commissioned to create paintings, of course, but also various design and architectural works. It was under the commission of Pope Julius II, that he began one of his most known works, School of Athens. Near the end of 1508, Raphael was summoned to Rome by Pope Julius II. He was commissioned to paint a series of painting in the papal appartmant that were being converted into his library, Stanza della Segnatura. Books were devided into four catergories: theology, philosophy, justice, and medicine. Julius II had a dislike for doctors, so portry took the place of medical books in his library. Each set of books had a fresco painting that represented the major contributors to that area of study. Raphael would paint three of the four. These began with many sketches in ink or chalk. The first fresco was the semicircle The Dispute of the Sacrament. The Pope commissioned his idea and even outlined the works general themes and characters. On these he began work at the top and worked his way down the scaffold. The second of these fresco paintings, under the muse of philosophy, origionally titled Knowledge of Causes, we can see the great minds of ancient Greece in the simulated School of Athens. Plato is lecturing at the head of the class, flanked by the statues of Apollo (the god of poetry and music) and Minervia (the goddess of wisdom). Leonardo da Vinci, Raphael's idol, is seen cast in the role of Plato. An ironic move since Plato had condemned the arts and banned painters form the ideal city in his Republic. Much of the fresco is based on varations of Leonardo paintings. Under the unfinished St. Peter's Dome (a simble of free thought), we see Plato with his finger pointing to the heavens as a symbol of divine glory as he holds his book Timaeus, where he discusses the nature of the universe. At Plato's side, Aristotle points to the ground to symbolize the humanistic times as he hold his book Ethics, where he explains that happiness is only achieved when we understand philosophical truths. There are clusters of people that are being taught by the leaders of any academic field, for example on the ground level at the far left, we see a group of people studying mathematics form Pythagoras. The mathematician teaches under the statue of Apollo because he was into stydying the harmony of numbers and music scales, known as octaves. Behind Pythagoras we see the old man in the corner. This is Zeno of Citium, the founder of Stoic philosophy is most likely debating ideas with Epicurus and his Epicurean philosophy as he writes in his book. On the right side of the work we see the bald headed Euclid, holding a compass on a slate. On the neck of his tunic, Raphael signs his initals "RVSM" ("Raphael Vrbinus Sua Mano" or "Raphael of Urbino, His Hand"). He is in the likeness of Donato Bramante, the architect of the Tempietto of San Pietro on the Vatican complex and who also reccomended Raphiel to Pope Julius. Looking down to study from Euclid (with his hands up), is Federico II of Gonzaga, who would become the commander of the Papal Army. Fifteen years after this painting was created, Frederico became primarally responsible for the Sack of Rome in 1527. Standing next to Euclid, holding a globe with is back to us, is Ptolemy, who studies Earth's geography. Facing him, and us, is Zoroaster, a astrologer priest and founder of the magi. He and Ptolemy are teaching Raphiel (in the black cap) and his best friend Il Sodoma (he was dismissed as Pope Julius II's painter and replaced by Raphiel). Slumped on the steps is Diogenes with a beggers cup. He was a philosopher who made his home in the streets of Athens and made a virtue of extreme poverty. This painting was painted on the wall of a room that is used by the Pope to sign various papers and documents. It is very close to the Sistine Chapel, where Michelangelo Buonarroti was also working on his paintings. It is said that Raphael snuck into the Sistine to see Michelangelo’s work and this painting style was used to mimic Michelangelo’s approach. Because the Sistine ceiling was such a large and unique project, it was unveiled in two parts. After the first half was unveiled, Raphael went with Bramante to ask the Pope to allow him to finish the ceiling. Michelangelo protested. The work obviously continued under Michelangelo and Raphael went on to paint other rooms in the Popes appartments. All the same, Raphael was so impressed with Michelangelo's work. The School of Athens had been finished for over a year, but the awe struck Raphael added Herakleitos to the painting, in the likeness of Michelangelo in the fall of 1511. He is seen resting on a block of marble. The Herakleitos association was a bit of a comment on how Raphael viewed Michelangelo; as Herakleitos was a but hard to understand due to his riddle-like philosophies, lived a life alone and was always suspicious of his rivals (like saying Homer should have been horeswhipped). Although Raphael found some admiration for Michelangelo, he saw Raphael as a young and envious copy-cat punk. 1510. Fresco, 26'X 18' 1510-1511. Vatican, Vatican City. 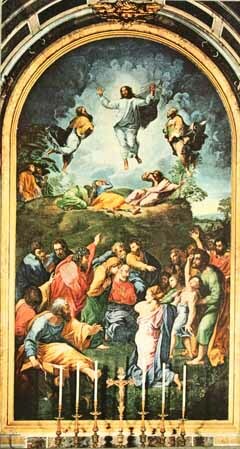 The Transfiguration was one of Raphael's great works. 1519-1520. Oil on panel. Vaticano, Pinacoteca Apostolica Vaticano, Rome. Raphael was most known and admired for his Madonna paintings or works focusing on Mary with Jesus as a child. He met and admired the art of Leonardo, and his influence can be seen in many of the compositions in the Madonna works. In his late career, Raphael was becoming more and more of a leader in the art world, being assigned to many important commissions. 1505. Oil on wood. The National Gallery of Art, Washington DC, USA. Sadly, his life was cut short. He was out having "a good time" with his mistress, Margherita Luti, on his thirty seventh birthday. We can see her in his work La Donna Velata. He went home with a high fever and died, ironically he was born and died on Good Friday. His funeral was held at the Vatican. His body now is at rest in the Pantheon. next to his bried-to be, Maria.